This refreshing ponzu soy sauce was made using kabosu citrus fruit juice and whole soybean soy sauce. No need to dilute: simply pour over your dishes to your liking. This product is 42.5% Kabosu citrus fruit juice from the southwestern Kyushu islands of Japan. 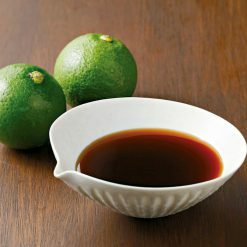 The ponzu soy sauce makes for a good addition to soups, to balance out the savory with the tangy citrus taste. Ponzu soy sauce can also be used as a sauce for white fish, such as flounder, and other dishes such as seaweed salad. The word ponzu, appropriated in the Japanese language today, originally comes from the Dutch. Pons, meaning punch, as in a beverage made from fruit juices, was appropriate to describe the kick and sourness in the ponzu sauce. 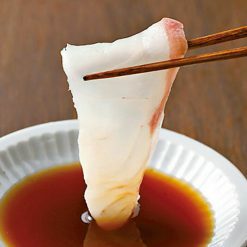 Usage suggestions include: marinating meats, such as chicken or flank steak in the ponzu soy sauce; glazing your meats with the ponzu soy sauce; using the ponzu soy sauce as a dipping sauce; adding the ponzu soy sauce to a stir-fry; using the ponzu soy sauce as a salad dressing. 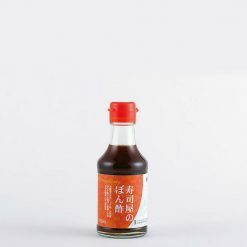 This sauce is often used in Japanese cooking with white fish (such as flounder), seaweed salads, stews, shabu-shabu pork hot pots, grilled fish, seared fish, dumplings, cold tofu, and even pickles. Due to the citrus ingredient, you may find some pulp in your sauce. Please shake well before use. After opening, please store in a refrigerator (at least 10 ℃). Please use this sauce as soon as possible after opening. This product contains kabosu citrus fruit juice, soy sauce, vinegar, sugar (raw sugar), salt, mirin, kelp extract, and you extract, yeast extract, fish extract (this product contains wheat and soy).